Remember a few years ago, when everybody was eating membrillo, manchego and marconas? (That's quince paste, cheese and Spanish almonds.) A new food fad had hit our shores, but nobody wanted to say "Guess what I discovered!" Instead, it was talked about in language that implied one had always known about such delicacies; what, are you only just now learning how to eat? OK, then, cupcakes. I still can't figure out the appeal of this current craze (but see, every day in grade school I found a cellophane-wrapped chocolate Hostess cupcake in my lunchbox, and I continue to detest the little bugs and everything that resembles them; don't even get me started on my playmates' birthday party fare). Obviously this is home eating; I'm not talking about foams and vapors and trick food, all of which are also trends. Pork belly, too. Me, resistant to trends? Not at all. I joyfully made my own quince paste from fruit growing on the supposedly ornamental tree in front of my house. And yes, consumed it with marconas and manchego. I'll probably get a box of Maldon salt, if I ever make it through the five-pound sack of so-called Sonoma sea salt. And now I've jumped onto another food trend, the salted fried-peppers tapa called pimientos de Padrón. Not a super-new trend, by any stretch (I am so not cutting-edge), but just on the culty side of popular. As of this past summer, they seem to have positively spread like contagion in the food blog world (and restaurant world, too). Unavailable in the U.S. until eight or nine years ago, they are now grown by David Winsberg of Happy Quail Farms in East Palo Alto. When Calvin Trillin wrote about them in the November 1999 Gourmet, I guess their fate was sealed. 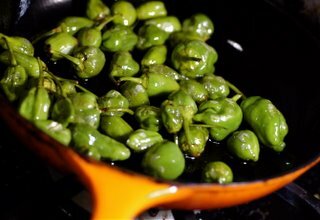 I know there must be untold numbers of travelers who have adored fried pimientos de Padrón with their tapas 'n' drinks in Spain, and were thrilled to find a source of supply at the Ferry Plaza farmers' market. Me, I've never even been to Spain. I've just heard about pimientos de Padrón. So I grabbed a sack of Happy Quail pimientos at the Marin Civic Center market recently, and fried them up and salted 'em to see what the buzz was all about. Still, it made for a fantastic meal (I wish I could show you, but no photo), including pan-toasted (domestic) almonds, slices of (domestic) dry Jack cheese, marinated (domestic) olives, and glasses of cheap-o real Spanish sherry from Trader Joe's. So, now I can say I've tried them. A belly of pork use to be our family joint for a sunday roast when i was a lass, as my mum will tell you if she stops by. An delia should take the blame for Maldon. I bet savuer would never have gotten wind of it if it wasnt for her. Mum used to mail me Maldon when I arrived here five years ago. She was cross with me for making her do so a couple of years later when we stumbled across a box of it together in Williams Sonoma. I have been having some kind of backlash against Maldon this year by switching to fleur de sel for the most part. its my new addiction. Yeah, and I still do respect the pork belly (even though I could barely swallow the seared version at Fifth Floor). I'm gonna get one someday and make bacon. Maldon... Maldon... wasn't he the actor on Streets of San Francisco? Well, one good thing about being on a remote island with no magazine subscriptions: We are completely oblivious to food trends. I mean...wha? Trends? About salt?? Chopper bought some Hawaiian salt of some sort while we were in Seattle, but only because I insisted it was pretty and pink. I visited my first Whole Foods Market Sunday in Santa Monica, and was amazed at the different kinds (and prices) of salt. I'll be a simplist (is that word?) and stick to my Redmond RealSalt from Utah. I sent calming, consoling thoughts your way this evening as shrub spoke. Oh, god. Two new salts for me to try. Thanks. For all you non/un/dis/believers, here's a definition: Jihad (Arabic: جهاد jihād) is an Islamic term, from the Arabic root jhd ("to exert utmost effort, to strive, struggle"), which connotes a wide range of meanings: anything from an inward spiritual struggle to attain perfect faith to a political or military struggle to further the ::Islamic:: (or insert "other" -- i.e., ::Born Again::) cause. The meaning of "(fundie) cause" is of course open to interpretation. The term is frequently translated into English as "holy war", although jihad can apply to more than just warfare. That sounds exactly like Bush. Live with it, or react. Wow, cool beans on Karl Malden. And speaking of Streets of SF or rather its first co-star, we deliberately ignored the SOTU tonight (nails on chalkboard is shrub's voice to me) and watched Wonder Boys instead. Love that flick. This was all back when Cranky was important in this city and I was wifey. Well, I'm still wifey. PS: (off topic) My secret Friday Harbor liaison tells me she *alway stays and eats at*... well, you know... !! I have seen all the salts but have never dived in. I am ashamed to admit that I always figured that salt was salt. I asked my mom, who currently resides in Mexico, if she had watched the SOTU when I spoke to her. She, like me, passed on that "pleasure." Everytime that man starts to speak, I start to gag. So cool about The Streets of San Francisco folks. I loved that show when I was a kid. Those peppers look and sound like something I'd really enjoy. Props to Cyndi for representin' with the Redmond RealSalt—really good stuff. Yeah, we got sea salt in Utah. Long story. I tried out Maldon and liked it, but I prefer others. My mom's got me hooked on this Korean sea salt that's super moist, like wet sand. Okay, this has nothing at all to do with salt, but... since you mentioned papa Kirk, and since folks are talking about the SOTU, which naturally brings up stupidity of war sentiments in at least a few of us, allow me to recommend a hard-to-find but most excellent (anti-) WWI flick -- Paths of Glory, 1957, directed by Stanley Kubrick and starring Kirk Douglas. Damn, it's a brilliant piece of filmmaking. Track it down, peeps. Okay. Back to salt. I will encourage Chopper to do something spiffy with our new pink Hawaiian Salt so we can write about it and take purty pink piccies. Just to prove I'm older than anybody, I went to the s-c-r-e-e-n-i-n-g of Paths of Glory when I was a media wifey in Manhattan! Salt is way hot. A friend was cooking in my kitchen and was appalled by my narrow choices. Too bad -- I moved three months ago and threw out all the half-finished, outdated, etc. condiments and herbs. It IS fascinating to see the speed with which specific foods fly to the "must have" list in our world. Jungle drums? PS -- Of course, I was a child bride, and this was the year before I married. MmM, love salt. Got many salts. Some were gifts and some I had to have, so I bought them. Australia has some bitchen flaked salt that when sprinkled over fresh garden maters (not this time of year, no) is the best ever. I hear the Japanese have some killer ones as well, but haven't been there yet. A friend brought me some sel from Paris, not sure what's in it though. The label doesn't say much, it's good though. Michael Chiparillo's Grey Salt is okay, but not worth the money. Over the veggies I find the Viking Smoked Salt can't be beat, like putting a bonfire in your mowf. I have to say though peppers intrigue me just as much. The Bali Long peppercorns have this spark, then finish with a floral bouquet, darned fine. But my all-time new favorite is the Sarawak Creamy White peppercorn. I have a special grinder (along with a handful of others) just for it, I won't be without it, no sir. I'm thinking my next stop for salt might be in Peru! Cyndi, I went and checked out Redland online, and I'm impressed (and ready to try some!). How on earth (hah) did you come across it? Dagny, if you read Biggles' comment below, you'll see how darn seductive salt collecting can be. It's not too expensive a habit. Jamie: I don't expect to see the Happy Quail Farms guy at the market until warm weather returns. We should experiment on some other thin-skinned, not-too-hot variety, eh? Vanessa: OK, I'm trying both of those suggestions (and you *know* I am)! kudzu: I forgot to add another "hot" food item everyone seems to be zeitgeisting about (and oddly enough, it has to do with salt): Salt Caramels. mrs d: Cranky has seen "Paths," and says he'll rent it for me. Biggles: I have some Japanese salt. Don't like it 'cuz it's very fine, dry and overly salty. Next time I see you I'll bring a bag. Oh great, I get the stuff you don't like? Just tryin' to save you a trip to Japan, but maybe you don't want to be saved. The first time I saw (and bought) Redmond RealSalt was at a little market in Escalante, Utah (we were camping nearby). It's so cool that it's a SEA salt, but mined thousands of miles from a (current) sea. I have learned recently that I can get it at Clark's Nutrition Center (health food/grocery/holistic meds, etc.) in Loma Linda, about 20 miles from here. Cyndi: I actually had Cranky stop the car in Bonneville once so I could scrape up salt... too minerally to eat, but, boy, I was Foraging! You must be pretty remote.